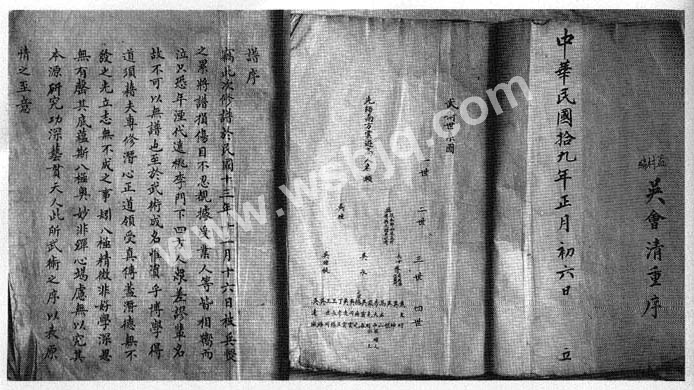 Before the 1936 manual was printed, Wu HuiQing produced different handwritten manuals that were dispatched among the BajiQuan practitioners around MengCun and served as draft for the printed copy. You will find above a picture of one of them, written in 1930. This manual was a pristine shape manuscript, with a full genealogy tree identical to the one published in 1936. Unfortunately, this precious document was stolen from the Wu family in 1966 at the beginning of the Cultural Revolution. However, some polaroid pictures made in 1991 are still available and indicate that the book has not been detroyed. “I have compiled this manual from the manual that suffered from the turmoil of war on the 16th day, 12th month of 13th year of Chinese republic (i.e. 1924). I could not bear to look at the destroyed manual and at all the disciples and other people who were all looking at each other and crying. I feared that the time immemorial disciples and masters, all this people here and there, would have their names falsely recorded, so it was impossible to stay without manual. This will also help to make martial art famous. To support the just cause of erudition, one must focus on the teaching of a genuine master, concentrate on the correct principles, and receive instruction directly from a master. Then the hidden virtues will inevitably come to light, and the determined people will succeed in all their actions. Furthermore, the one who devotes himself to studying the profound essence of BajiQuan will find that its deep content is infinite. Thus, to understand the secret of BajiQuan, one must not hesitate to devote his entire mind and to search for the original source of this style. In the preface of this book, my sincere intention is to express my original motivation : study the deep achievement of BajiQuan, and transmit its skill everywhere under heaven.